I’ve been thinking about what to make for my Mother’s Day post for the last two weeks! It has to be yummy and special and of course something that my mom would like. It was going to be something with okra and had the recipe all made up. 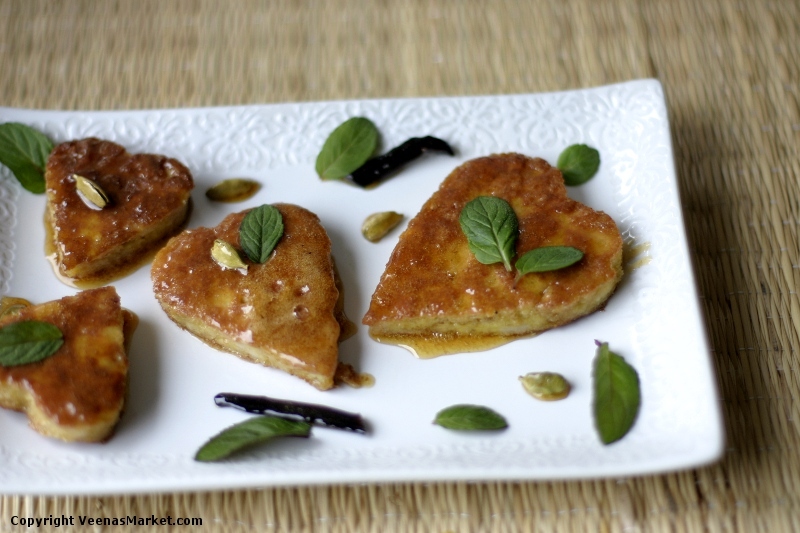 But then I was researching an easy dessert for my cooking club’s Spanish night and came across this recipe for breadcrumb fritters in honey syrup reflecting monastery cooking. There were no pictures but I was instantly transported. I could see monks in long robes gathering up the rosemary for the honey syrup. And saving leftover bread to use in the fritters, ensuring no food went to waste. What was harder to imagine was monks having a decidedly delicious and un-austere meal, much less dessert. Go monks! I love a recipe with a story, don’t you?! I made the Spanish breadcrumb fritters with rosemary infused honey syrup on Monday. It came out well. But on Tuesday morning, I had a light bulb moment. This recipe could be ‘Indianized’. I changed all my plans and got to work creating my take on an Indian version of the Spanish dessert. Here is what I ended up with. Beat the eggs in a bowl. 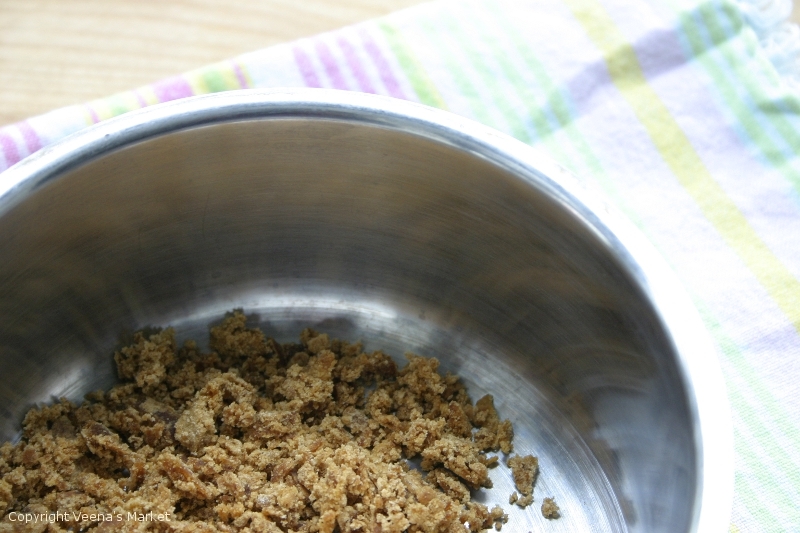 Make bread crumbs from 3 slices of bread. I simply tore off small pieces (very therapeutic if you’ve had a long day). You can also use a sharp chef’s knife and dice the bread. 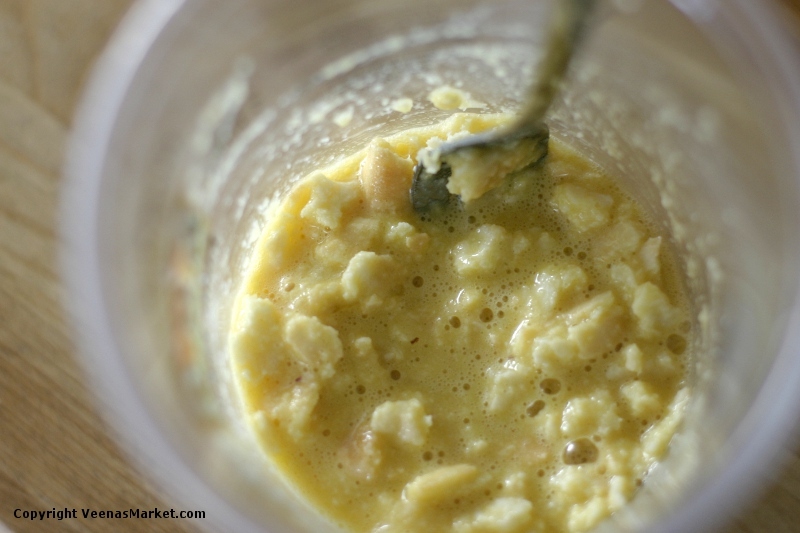 Add it to the eggs along with 3 tablespoons of almond meal. You should have a fairly thick batter. If it runs too easily, add more almond meal and or bread. Heat the coconut oil in a skillet or frying pan over medium heat. 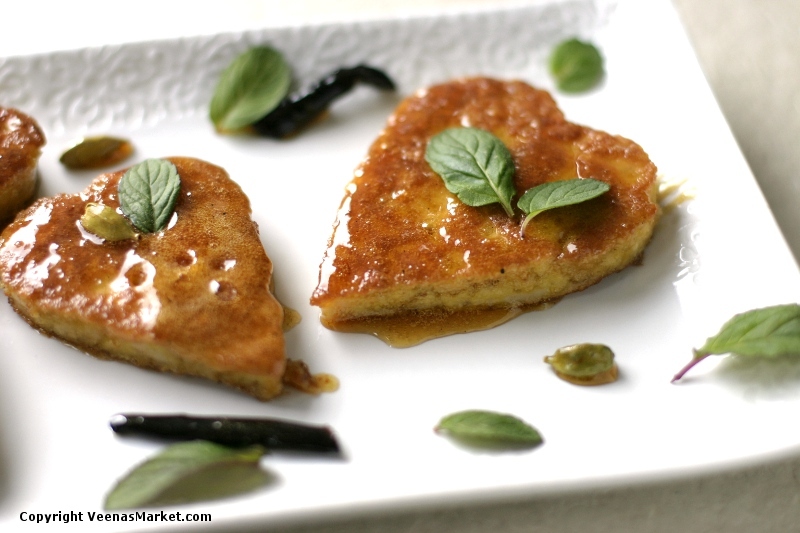 Once the oil starts shimmering, pour half the batter and spread to make a 1/4 thick ‘pancake’. Once the pancake is golden brown on the bottom, flip and cook till the top is also golden brown. 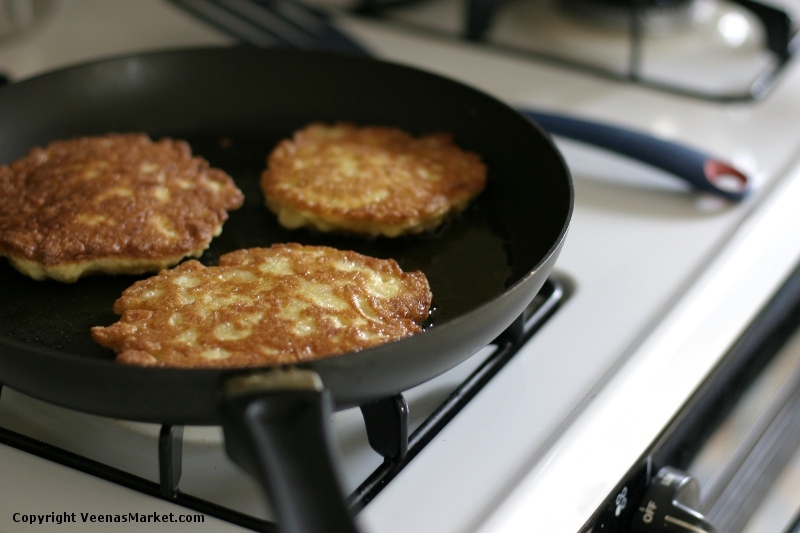 Put aside on paper towels so that the excess oil gets absorbed and the fritters crisps up. Repeat with the rest of the batter. Cut into hearts using cookie cutters or simply into squares or diamonds. Next, prepare the honey. The easiest way to infuse honey is to open up a jar of honey, insert the vanilla bean and cardamom pods, close the lid and let sit for 2 weeks. If you can’t wait 2 weeks, the next best thing to do is to heat the honey, spices and water over low heat in a thick bottomed pot for about 10-15 minutes so the flavors come together. Don’t allow the honey to bubble up. It is important to not heat the honey on high heat as it will change the flavor or worse, caramelize the honey. 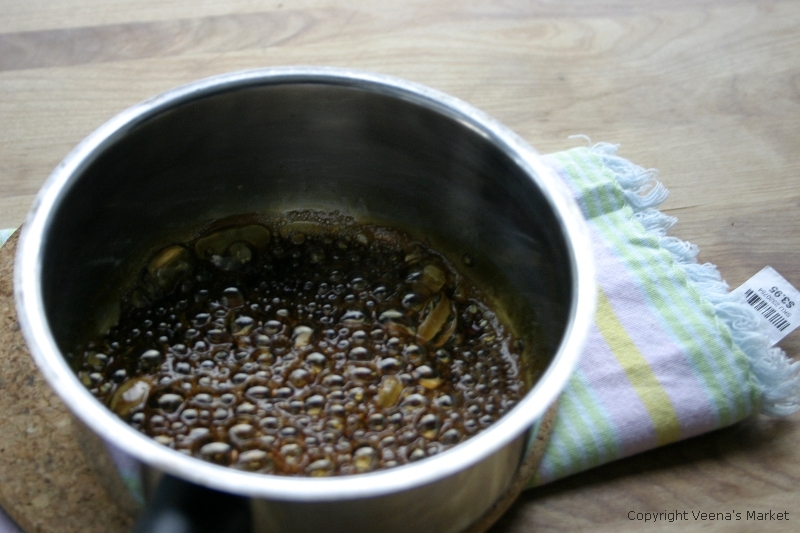 For even better control over the heat, use a double boiler or make your own: place the honey in a small pot and place that pot in a bigger pot with an inch of water. Place the pancake fritters in the honey syrup making sure they all get coated. 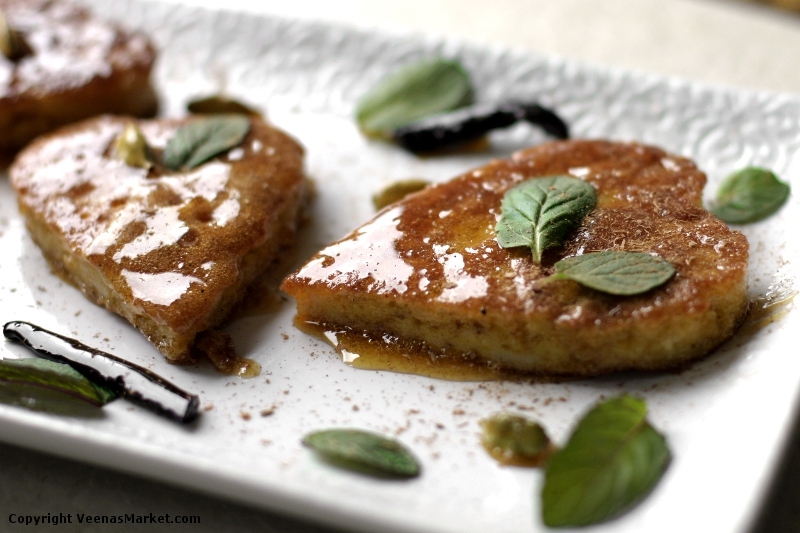 Arrange them on a plate or a bowl and pour any remaining syrup over them. Dust with freshly ground cinnamon and garnish with mint. Give mom a hug. 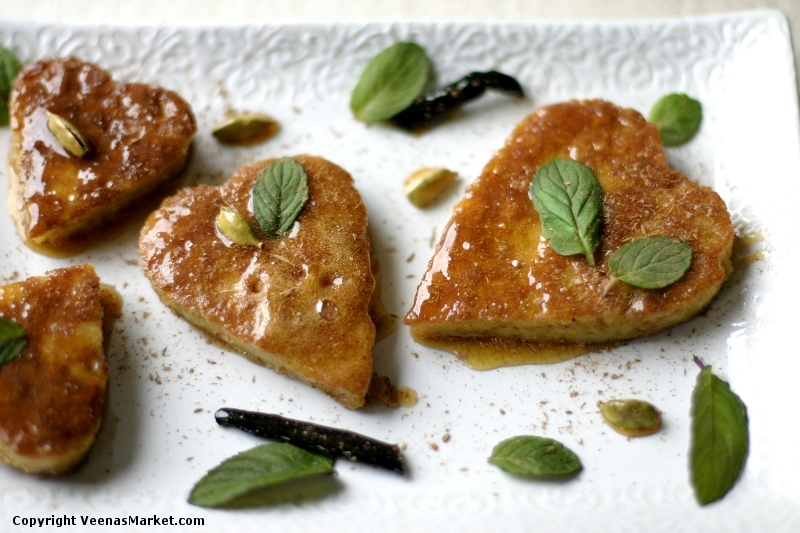 Its Day 3 of the Diwali Dessert week! 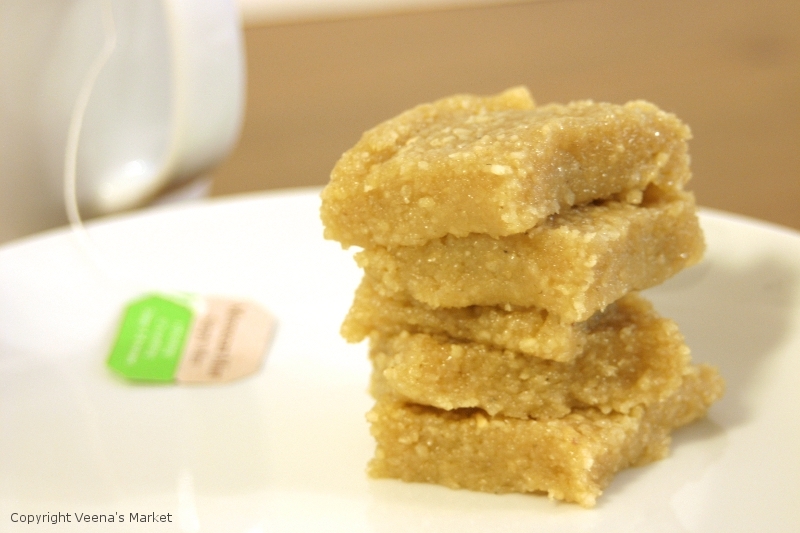 Today’s recipe is inspired by one of my grandmother’s signature desserts – cashewnut ‘burfi’ or squares. But because of all the ghee and nuts that she used, she’d only make it for special occasions such as my birthday! After the ground cashews and melted sugar are cooked together, the dough is flattened out onto a plate and left to cool before cutting into diamonds. But I could never wait till the squares were formed and I’d get a small cup of the smooth and gooey dough. And then I’d eat it one spoon at a time slowly savoring its rich feel on my tongue. Eating the squares was just as tasty but a different experience entirely. When I finished making this today, the light was already fading fast. The squares hadn’t fully formed yet but I had to shoot the pictures. I regretted not having cooked the cashew dough a while longer. But then I remembered that I preferred it this way. 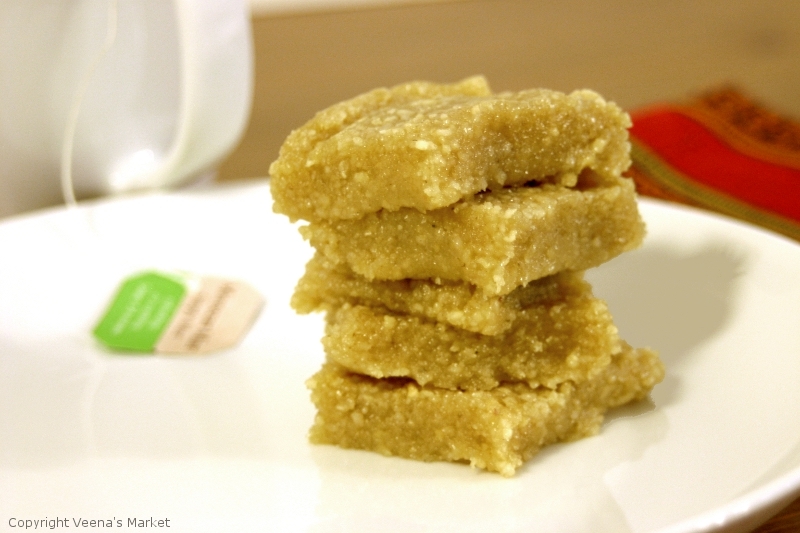 Traditionally, the ingredients for this dessert, also called kaju katli, are cashews, sugar, ghee and either milk or water. 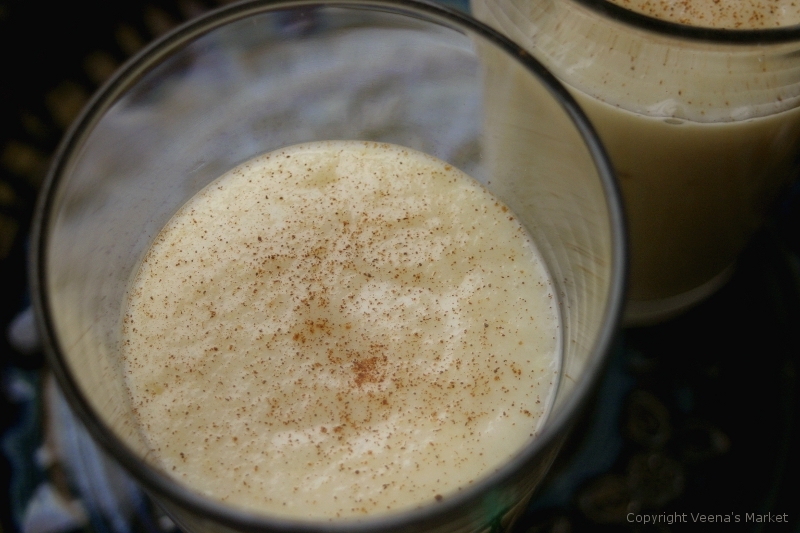 Instead of milk and most of the sugar, I added spiced applesauce. This was one of the suggestions made when I asked for what local / seasonal ingredients you’d like to see featured. I’ll confess that I wasn’t sure at all if the slight acidity of applesauce and the nuttiness of cashews would go together. But I loved it. It was surprisingly good. I was relieved as I didn’t have a back-up. 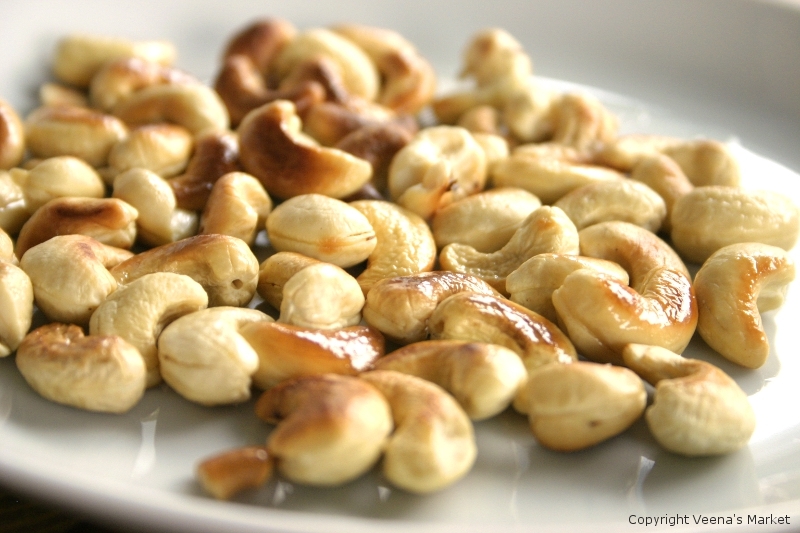 Lightly toast the cashew meal for 2-3 minutes on medium low. 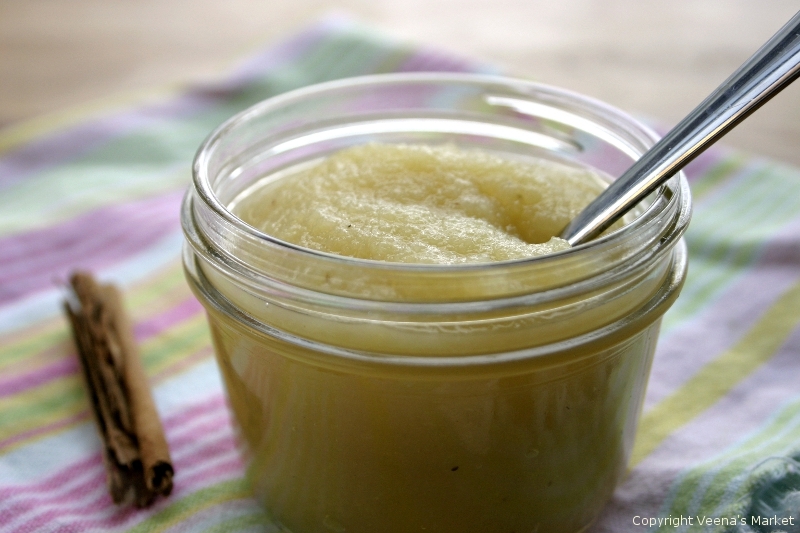 Simmer the applesauce with the cinnamon, clove and sugar in a thick bottomed pot. Do this for about 8 minutes on medium heat or till the sauce has gone slightly past bubbling to leaving the sides of the pot. 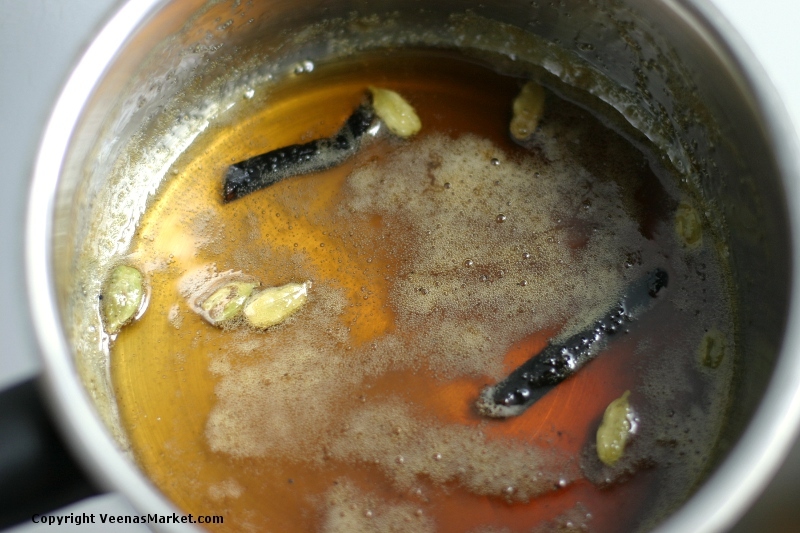 Add the cashew meal and ghee and reduce the heat to medium-low. Stir constantly for 5 minutes while incorporating into a dough. If you can take a small amount of the dough and make into a ball, it is ready to cool. Smoothen out in a quarter inch layer on a plate. 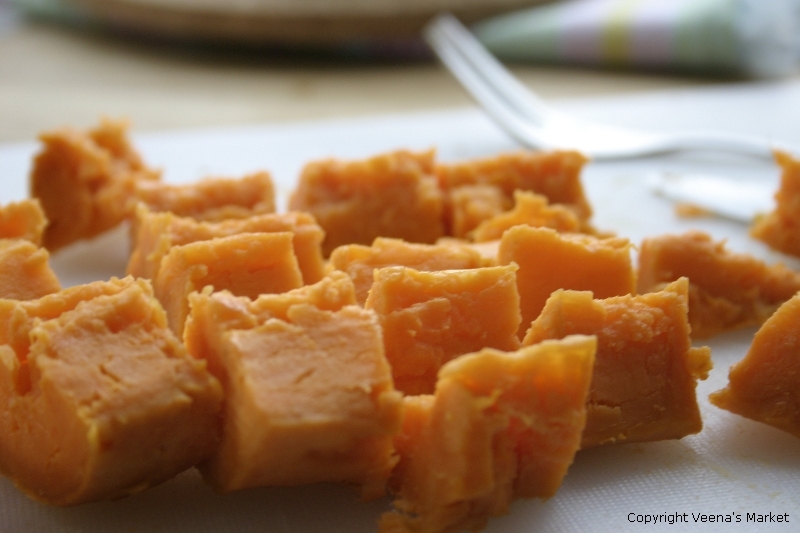 Leave to cool for 2-3 hours in the fridge before cutting into squares or diamonds. Or if you’re like me, just scoop some out into a bowl and dig in right away. It’s Day 2 of our Diwali Dessert week. 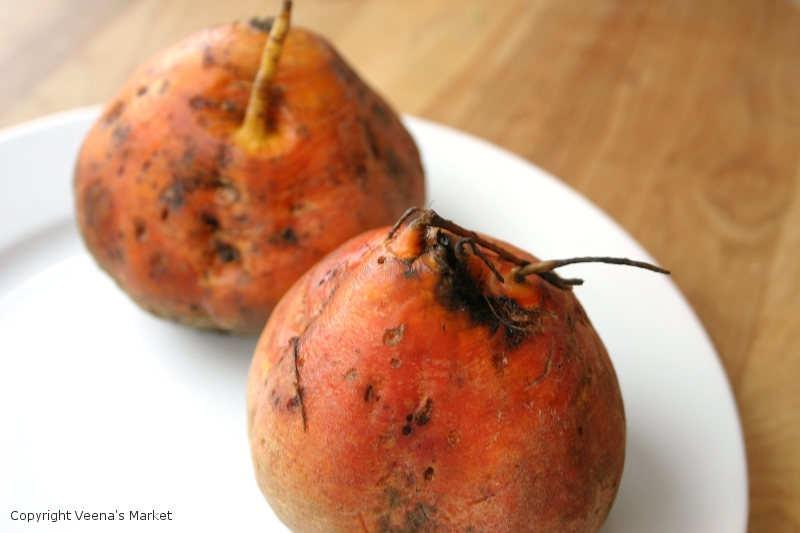 Didn’t catch the golden beets with roasted cashews yesterday? Tut-tut, but I’m sure this will corrected very soon! 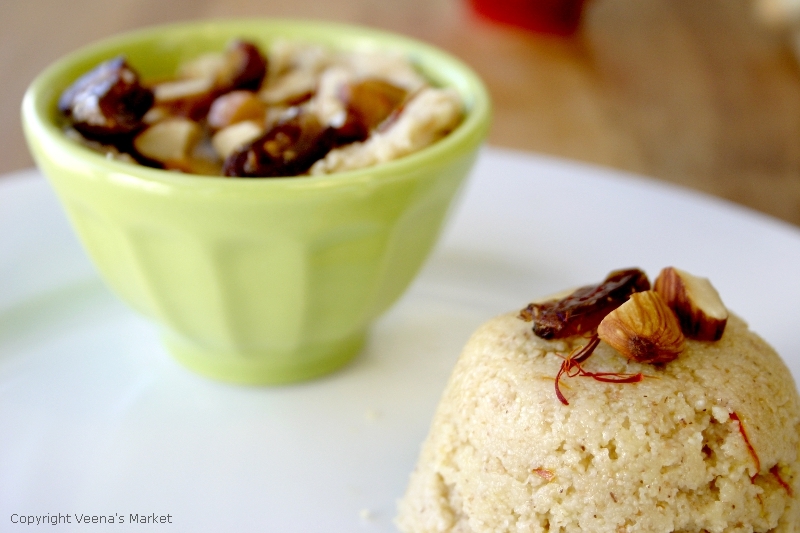 Today, we’ll be making Kesari Baath (saffron semolina pudding) but again with a twist. It’s also called Sooji Halwa in North India. Indian sweets use a lot of sugar. I can’t eat much sugar so doing a week of desserts is a challenge! 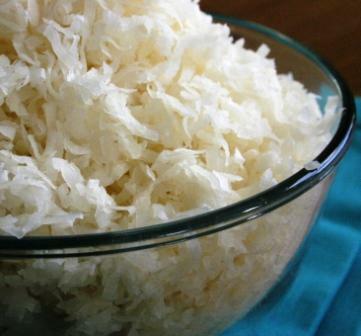 I mentioned yesterday that low glycemic sugar alternatives like coconut crystals are a great sugar substitute. 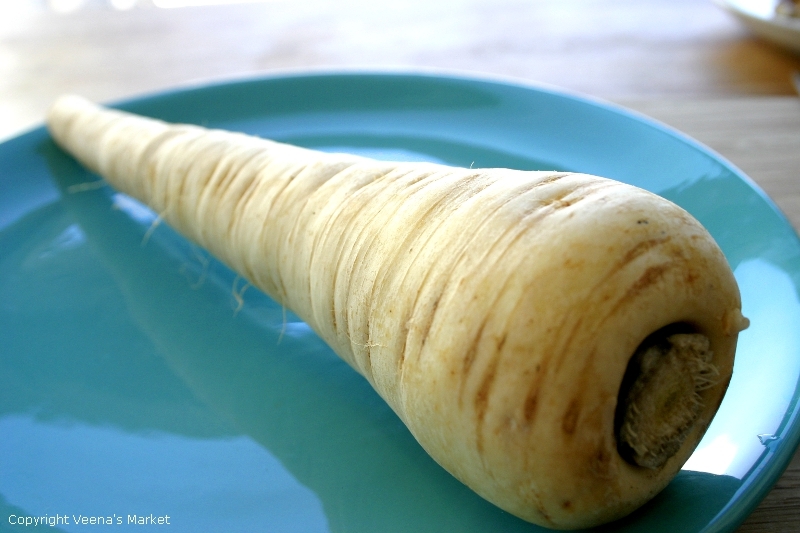 Today’s dessert uses parsnips as a natural sweetener. Cool, huh?! Another trick while making desserts less sweet is to heighten the experience by adding different layers of texture. 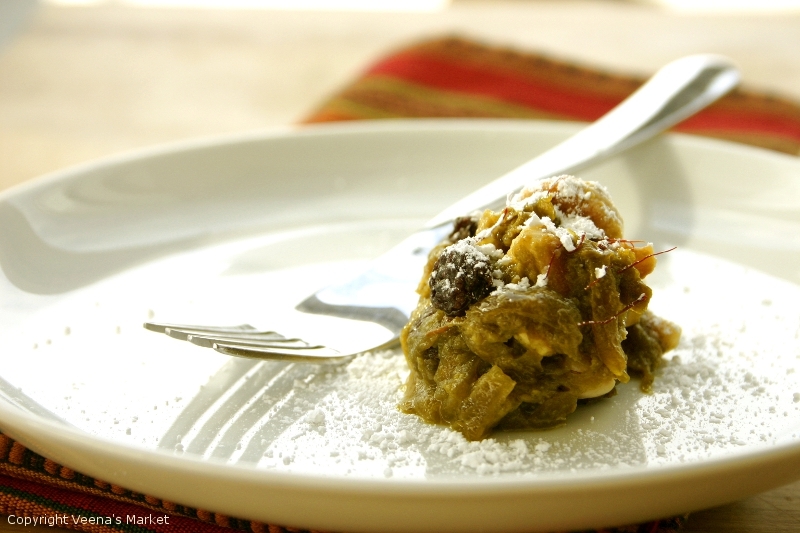 The dates in the recipe do this but also add some sweetness as well. The nuts add great crunch. 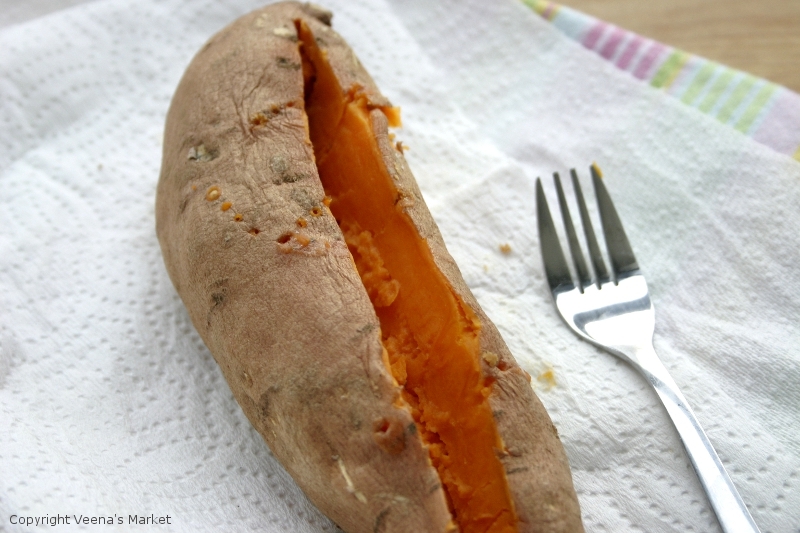 When I make this again, I think I’ll chop the parsnips instead of grating to add another layer of texture. The traditional Kesari Bath uses cashew nuts but since I used them yesterday, I went with almonds. I’m sure pecans or hazelnuts would work well too. Heat the ghee on medium heat in skillet till it melts. 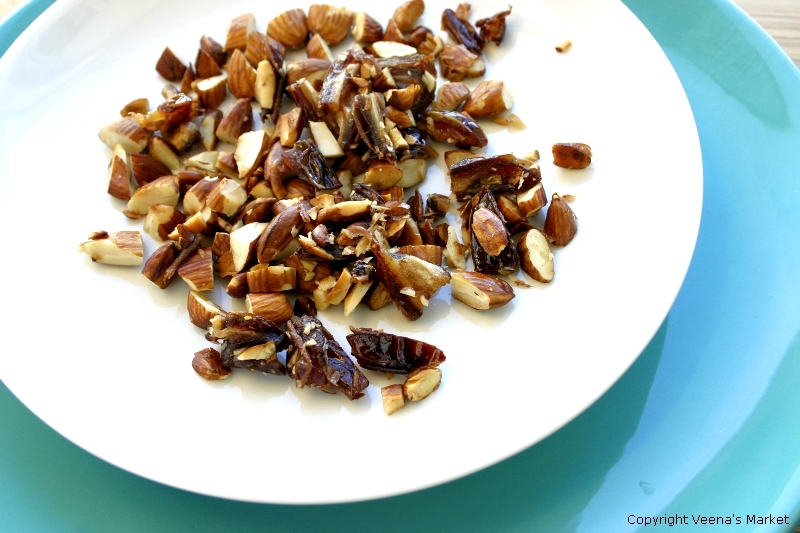 Roast the nuts and dates for 3 minutes while stirring frequently. Remove the nuts and dates and leave out to cook. 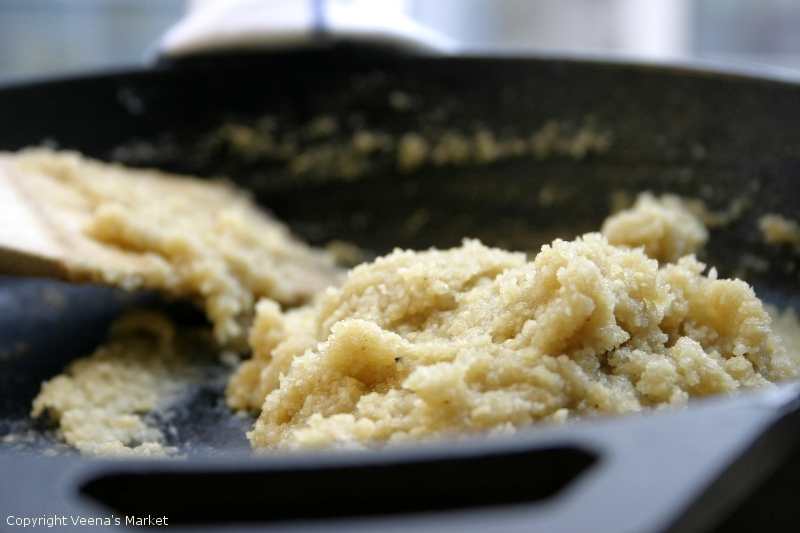 Roast the cream of wheat in the same skillet for 3 minutes or till it turns slightly brown. Heat the water and milk in a pot over medium heat. Add the grated parsnips, sugar and saffron. 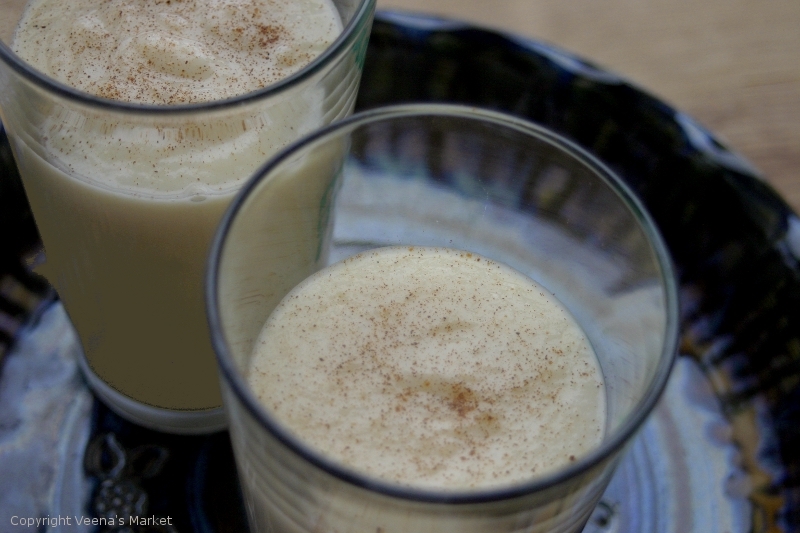 When the milk just starts to simmer, slowly add the roasted cream of wheat while stirring. Once all the cream of wheat has been added, remove the pot from heat and stir till cooked. You can either mix in all the nuts and dates or use them as garnish. 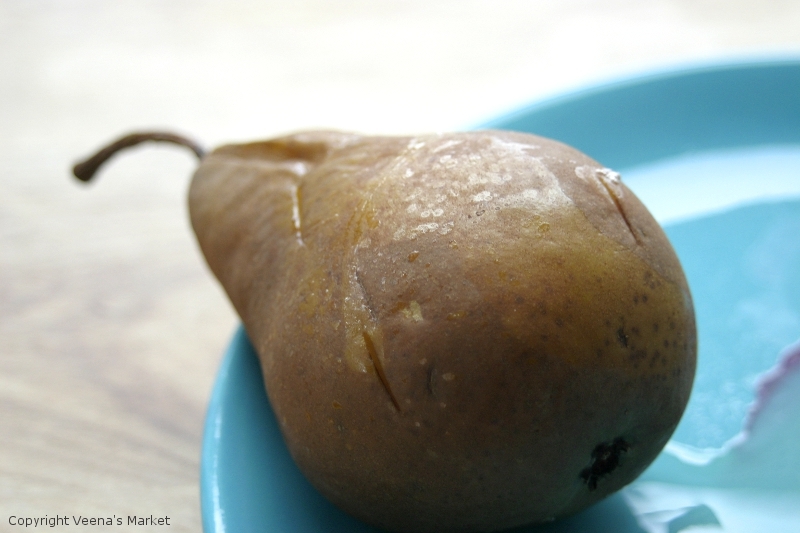 Enjoy this easy, yummy dessert! I can throw a curry together anytime. But baking intimidates me and I had a cookie party to go to. And I can’ take curry to a cookie party now, can I? And so while thinking about what I could take, I remembered the Swiss Christmas cookies my husband made two years ago right after the snowpocalypse we had in Seattle. He’s from Switzerland and since we weren’t going there for the holidays, he decided we’d bring Switzerland to Seattle instead. And then proceeded to make two kinds of cookies. He then followed that up with making Fondue Chinoise, the Swiss version of Chinese hot pot. And this is a guy that cooks twice a year. I was impressed! This year though it was up to me to make the cookies and I went with Brunsli, cookies made with almond flour and cocoa. 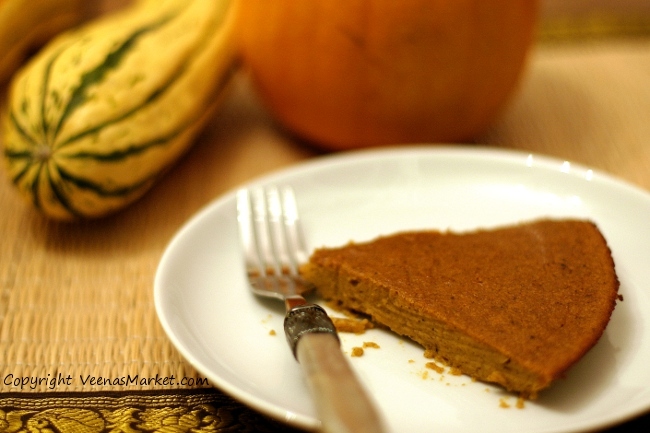 I used this recipe and tweaked it based on what I had available at home. I also left out the Kirsch since, from prior experience, what is available as cherry liquor here tastes more like cough syrup and is better avoided. I left out the flour as I only had whole wheat flour and wanted to make the cookies gluten free. Mix the sugar, salt, almond flour, spices and cocoa powder in a big bowl. Add egg whites and mix to form a dough. Divide the dough into 3-4 portions. Roll out a portion of the dough using a rolling pin into a sheet that is roughly a third of an inch thick. 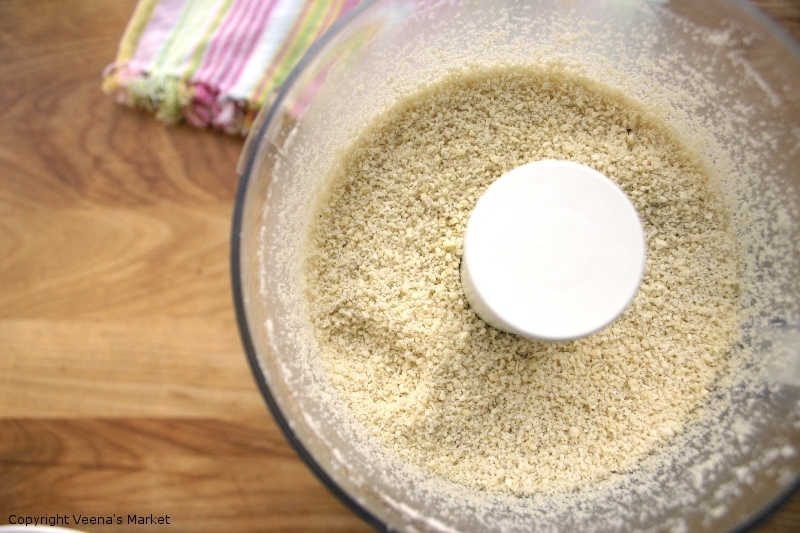 Sprinkle the slivered almonds on top and ‘fix’ them in place by going over gently with the rolling pin. Line a tray (or two) with baking paper. Cut the dough into squares or use a cookie cutter. Place the cookies on the tray. Once all the cookies are made, leave the tray out, uncovered, overnight. *I didn’t have enough time and only left them out for an hour*. This probably affected the consistency a bit. Heat oven to 480 degrees F and bake the cookies for 6 minutes. Take out the trays and place the cookies on a plate in a single layer. If you’re not serving them right away, store the cookies in an airtight box. As much as I liked the taste of my cookies, I knew they were not perfect. So what lessons did I learn with my cookie experiment? Follow the directions! They didn’t feel quite done after 6 minutes and I put them back in the over for another few minutes. They ended up a bit harder than I would have liked. As much as tweaking recipes is fun and often required, you should know when to tweak and when to leave alone. If its the first time with a recipe, follow it first. You can tweak it the next time. Trying something completely new in the kitchen is exciting! Gladly, this was an easy recipe to start with and I knew there wouldn’t be any Swiss people at the party who’d know how the cookie was supposed to taste like. And lastly, although I ‘share’ my recipes on the blog, sharing in person is sweeter. Way sweeter! The poor coconut has been much maligned as being unhealthy and laden with cholesterol. That view may be changing now as I found out on a recent tour of a grocery co-op lead by a nutritionist. Though high in cholesterol, coconuts contain medium chain triglycerides, or MCT’s. 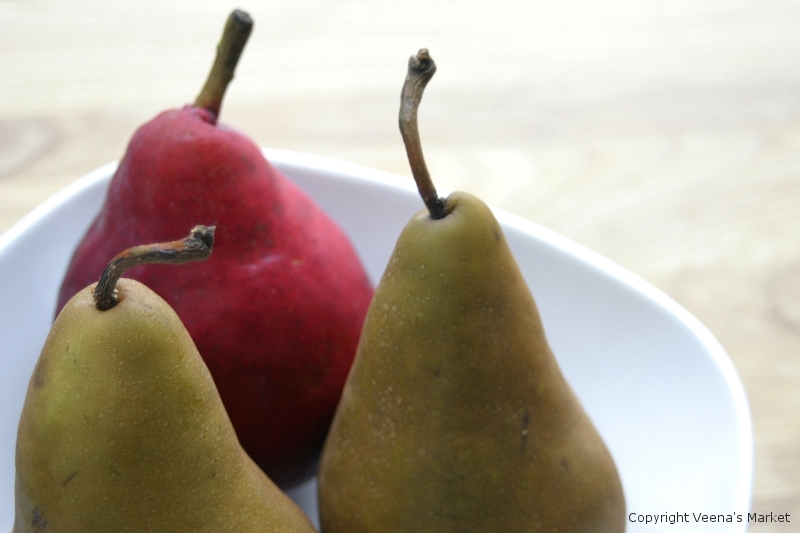 MCTs are easily digested and are converted into energy right away as opposed to other fats that are stored. Some research suggests that consuming more coconuts can help you lose weight! 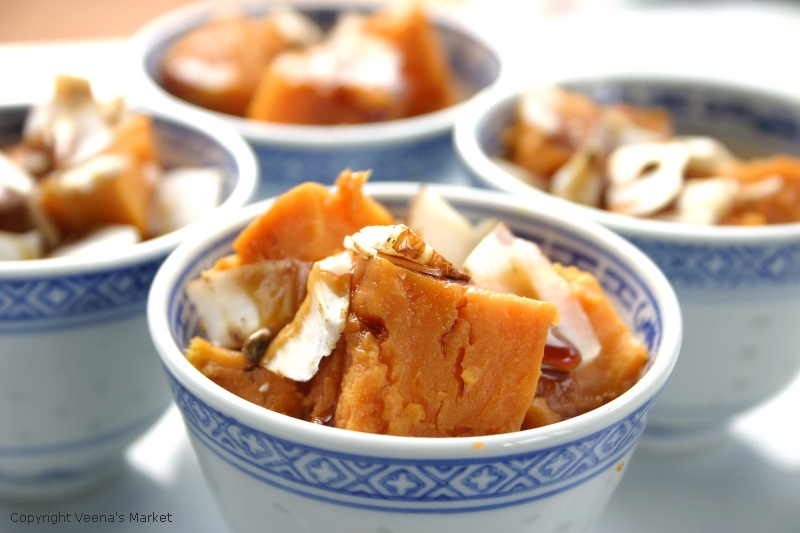 I’ve always loved coconut is all its forms! Tender sweet coconut water is the best thing on a hot summer day. The next best thing is scooping out the still tender white flesh that later thickens into meat. 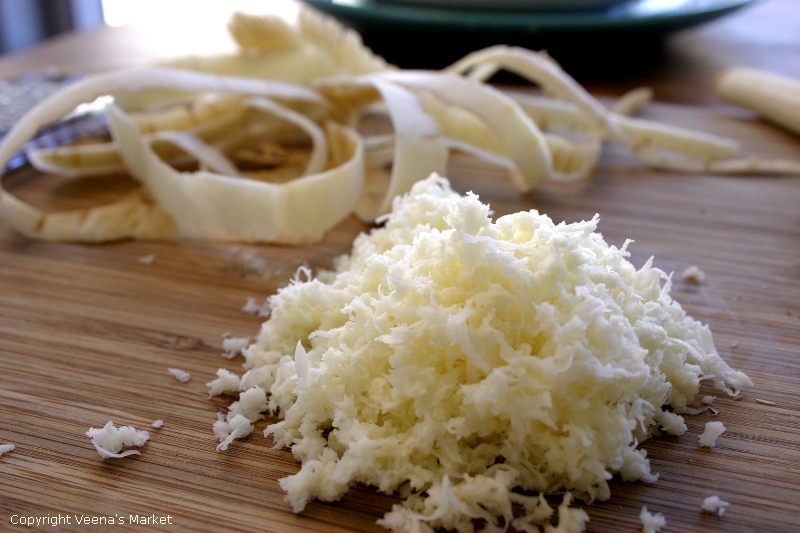 Grated fresh coconut adds instant deliciousness and texture to ‘curried’ vegetables – see my earlier post. And of course Thai curries and soups made with coconut milk (made by squeezing grated coconut meat) are so flavorful. Writing about coconuts reminds me of my grandmother’s lovely garden where she has five or six coconut trees. One of my ambitions as a child was to climb one of these trees and harvest my own coconut. I’d seen men shinny up coconut palms using a technique where they alternated hands and feet. This was one ambition that was soon dropped as I could never replicate the frog-like technique. Fast forwarding to the present, I’m just happy that we can buy coconuts and coconut milk in the market! I’ve noticed recently that many of my friends also love coconut and so I do end up using it quite regularly. For a recent dinner party, I’d offered to bring a dessert. I didn’t have any fresh coconut left but did have some Baker’s sweetened coconut flakes. Coconut “burfi” (a general word for many sweets in India that can be cut into squares) came to mind and I made it, though in a non-traditional way. It was moist and crunchy at the same time and everyone liked it. Best of all, it is super easy to make though after my introduction on how healthy coconuts are, I should probably stick to fresh instead of processed coconut flakes! Here’s the recipe. It serves 8. Simmer the milk on medium-low till it comes to a rolling boil. Add the remaining ingredients and stir well. Simmer for 30 minutes or till the mixture has thickened and there is almost no liquid left. Stir occasionally to avoid burning. Let it cool a bit and spread the coconut mixture in a thick layer in a buttered pan. Refrigerate (or even freeze) for a few hours to get it to set. Don’t worry too much if it won’t harden. It will still taste fine. Enjoy this yummy dessert and the lovely floral saffron with the woody notes of cardamom perfectly matched with sweet and crunchy coconut! And a quick tip if you’re shopping for this amazing nut. Choose one where you can hear the liquid sloshing around inside when you shake it.